She is also sueing the federal government over listing the polar bears as a threatened species. The science was even compelling enough to convince the Secretery of the Interior that the bears needed to be listed. But acknowlegement of this issue, and the potential disruption to development on Alaska’s oil-rich north slope spurred Palin to attempt to stop the listing. So, if McCain had made his selection six months ago, the squeaky-clean governor meme would have made a little more sense. But, Sarah Palin is currently under an ethics investigation by the Alaska state legislature. The details of this investigation read like a trashy novel, and I suspect that the players will soon have newfound celebrity on the national stage. I’ll try to explain for all you non-Alaskans who suddenly have good reason to want to know more about Sarah Palin. For those of you not interested in trashy novels, feel free to skip ahead. Here it is…what we in Alaska call “TrooperGate”. After all this, Wooten was investigated and disciplined on two counts and allowed to kept his position with the troopers. Enter Walt Monegan, Palin’s appointed new chief of the Department of Public Safety and head of the troopers. Monegan was beloved by the troopers, did a bang-up job with minimal funding and suddenly got axed. Palin was out of town and Monegan got “offered another job” (aka fired) with no explanation to Alaskans. Pressure was put on the governor to give details, because rumors started to swirl around the fact that the highly respected Monegan was fired because he refused to fire the aforementioned Mike Wooten. Palin vehemently denied ever talking to Monegan or pressuring Monegan in any way to fire Wooten, or that anyone on her staff did. Over the weeks it has come out that not only was pressure applied, there were literally dozens of conversations in which pressure was applied to fire him. Monegan has testified to this fact, spurring an ongoing investigation by the Alaska state legislature. But, before this investigation got underway, Palin sent the Alaska State Attorney General out to do some investigative work of his own so she could find out in advance what the real investigation was going to find. (No, I’m not making this up). The AG interviewed several people, unbeknownst to the actual appointed investigator or the Legislature! Palin’s investigation of herself uncovered a recorded phone call retained by the Alaska State Troopers from Frank Bailey, a Palin underling, putting pressure on a trooper about the Wooten non-firing. Todd Palin (governor’s husband) even talked to Monegan himself in Palin’s office while she was away. Bailey is now on paid administrative leave. As if this weren’t enough, Monegan’s appointed replacement Chuck Kopp, turns out to have been the center of his own little scandal. He received a letter of reprimand and was reassigned after sexual harrassment allegations by a former coworker who didn’t like all the unwanted kissing and hugging in the office. Was he vetted? Obviously not. When he was questioned about all this, his comment was that no one had asked him and he thought they all knew. Kopp, defiant, still claimed to have done nothing wrong and said to the press that there was no way he was stepping down from his new position. Twenty four hours later, he stepped down. Later it was uncovered that he received a $10,000 severance package for his two weeks on the job from Palin. Monegan got nothing. Before her meteoric rise to political success as governor, just two short years ago Sarah Palin was the mayor of Wasilla. I had a good chuckle at MSN.com’s claim that she had been the mayor of “Wasilla City”. It is not a city. Just Wasilla. Wasilla is the heart of the Alaska “Bible belt” and Sarah was raised amongst the tribe that believes creationism should be taught in our public schools, homosexuality is a sin, and life begins at conception. She’s a gun-toting, hang ‘em high conservative. Remember…this is where her approval ratings come from. There is no doubt that McCain again is making a strategic choice to appeal to a particular demographic - fundamentalist right-wing gun-owning Christians. And Republican bloggers are already gushing about how she has ‘more executive experience’ than Obama does! Above is a picture of lovely downtown Wasilla, for those of you unfamiliar with the area. 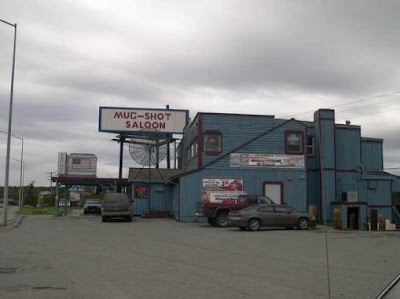 Behind the Mug-Shot Saloon (the first bar I visited when I moved to Alaska long ago) is a little strip mall. There are street signs in Wasilla with bullet holes in them. Wasilla has a population of about 5500 people, and 1979 occupied housing units. This is where your potential Vice President was two short years ago. Can you imagine her negotiating a nuclear non-proliferation treaty? Discussing foreign policy? Understanding non-Alaskan issues? Frankly, I don’t even know if she’s ever been out of the country. She may ‘get’ Alaska, but there are only a half a million people here. Don’t get me wrong….I love Alaska with all my heart. I’m just saying. This is the wedge-issue, desperate ’Hail Sarah’ pass of the McCain campaign. Now I’m off to get some Jiffy Pop.